The famous download.com website did an interesting review of Mahjong In Poculis. Let's introduce the game description by using their own words: "Overall, this is the best digital version of mahjong that we've encountered, and we recommend it." This Mahjong game was develop with simplicity in mind: you choose a theme, a layout and you can play immediately. In this Mahjong game, which is by the way an excellent way to challenge your memory, you'll have to select pairs of tiles having identical symbols to make them disappear. The main difficulty comes from the classical Mahjong Solitaire rule: only layout's border tiles are candidates for selection. The game is won when there is no tile left on the board. The next layout starts automatically until you finish all the layouts from the current theme. The main key words are: discipline, strategy and of course a little bit of luck. A 5 step in-game tutorial quickly reminds you the game rules. You can activate it by clicking the question mark at the upper right screen corner. The game comes with 6 fun themes having for each one: 50 layouts and 5 medals to win. In expert mode, you'll need to play the game around 150 hours to overcome the 300 layouts. Each theme (Christmas, Halloween, Asian, Easter, Wonderland and Future) has its own layouts, graphics, musics and sound effects. Novice: Each time that there is no more possiblity for association, tiles are shuffled to let you continue playing. Standard: Once there is no more possibility for association, tiles are shuffled to give you a second chance. Expert: No second chance. You need extreme concentration to be able to overcome all the layouts. Whatever your chosen playing mode, you can challenge your best time or your best score. For scores, you can make Combos, i.e: a specific sequence of pairs giving you more points. Best scores come from this kind of sequence: a pair of 1 followed with a pair of 2, a pair of 3 and so on until a pair of 9. Such a sequence gives you more than 177 000 points if the tiles come from the same family! When you exit the game, a dialog box shows your global statistics. You can then publish your scores on the Mahjong In Poculis' website, without any registration step. This product for iPad, Android, Mac and Windows is free without any limitations. You are simply encouraged to buy a copy if you feel that the general quality lives up to your expectations. A lot of Mahjong players have discovered the game on Windows with Mahjong Titans, which is the free Mahjong game that comes with the system. This Mahjong Titans is a good game, tiles are easy to distinguish from each others and rules are easy to understand because each bad action is explained. Mahjong In Poculis may be less accessible but is more evolved. The main difference comes from the score system. With Mahjong Titans there is nothing more simple, just quickly associate identical tiles and you are good. In our Mahjong game, if you want to make high scores, you have to make specific sequences. Don't hesitate to activate the complete game screen by clicking the upper right button to see your sequences' details. Make a sequence like 1,1; 2,2; 3,3; ... 9,9 from the same familly and you'll get 170 000 points! Throw a glance to the FAQ to get more explanations. Who speak about Mahjong In Poculis ? 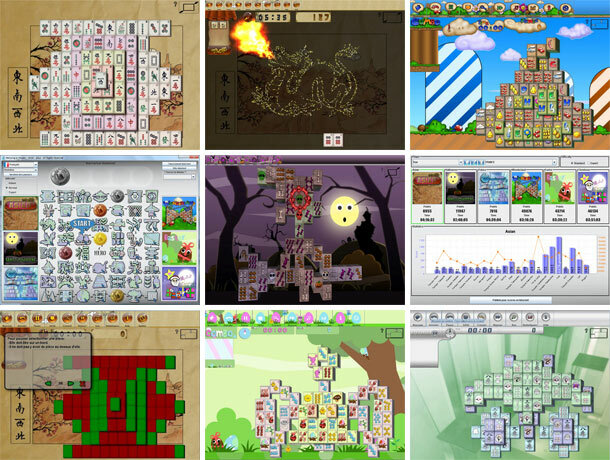 Mahjong In Poculis has been referenced on the main websites dedicated to downloading. The most famous of them, Download.com, offers you a lot of players' reviews. To see a video of this Mahjong game you can visit Tucows.com. Finally Softonic.com has reviews written in foreign languages. You can also try some not free Mahjong games. Copyright (C) 2001-2017 In Poculis.